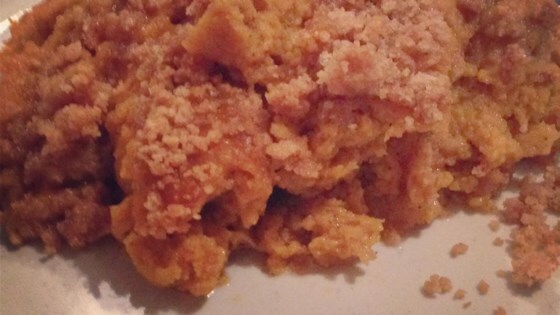 "I found directions online for cooking and freezing pumpkin after Halloween one year. I collected several pumpkins that did not get carved and cooked and froze a ton, hence the need for pumpkin recipes. I put this recipe together myself while in a creative mood one night. I am surprised I do not see more recipes using French vanilla coffee flavoring; it adds a nice touch." Mix pumpkin, sugar, butter, French vanilla-flavored coffee creamer, eggs, salt, cinnamon, and vanilla extract together in a bowl until evenly combined; pour into an 8x8-inch baking dish. Bake in the preheated oven until pudding is set, about 40 minutes. The French vanilla creamer gives this that special taste. Feel free to cut back and substitute some milk if you like a more mild flavor. I use frozen fresh pumpkin puree, if using canned pumpkin add a little more milk to have a pancake batter consistency. Great anytime but particularly seasonal in the fall.